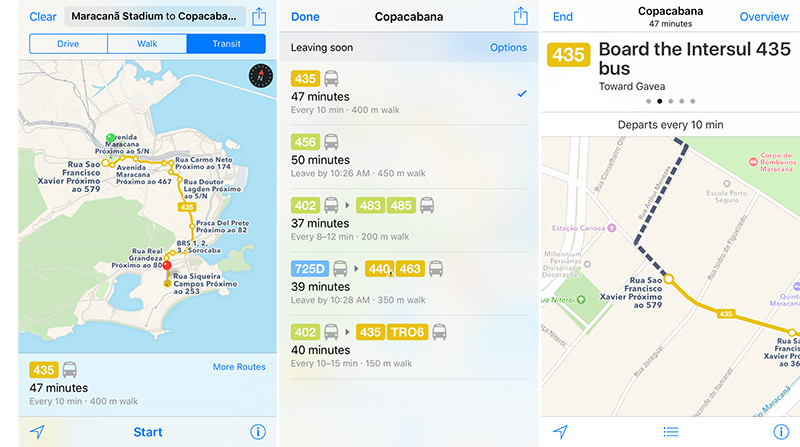 In time for the 2016 Summer Olympics, Apple Maps now supports transit routing in Rio de Janeiro, the second most populous city in Brazil. Transit directions are available for travel by bus, ferry, metro, and train throughout the Rio de Janeiro metropolitan area, including connections to and from Belford Roxo, Duque de Caxias, Itaboraí, Japeri, Magé, Mesquita, Nilópolis, Niterói, Nova Iguaçu, Queimados, São Gonçalo, and São João de Meriti. Supported transit operators include Internorte, Intersul, Metrô Rio, SuperVia, and others. Rio de Janeiro is the fifth new city to support Apple Maps transit over the past month, alongside Austin, Montréal, Portland, and Seattle. Apple added Transit to Maps as part of iOS 9 in select cities around the world, including Baltimore, Berlin, Boston, Chicago, London, Los Angeles, Mexico City, New York City, Philadelphia, San Francisco, Sydney, Toronto, and 30 cities in China. Additional regions should be added over the coming weeks and months. No, but they are all getting Zika shots. Athletes should map the quickest routes to hospitals. Rio is still woefully unprepared to host the Games. My understanding is that crime is fairly high in Rio and that they are trying to get that cleaned up for the Olympics. Still getting lost could be an issue especially in a place where you might not speak the language and that has a high crime rate. Hopefully things like this will help. They probably should have taken the money they spent on the olympics and spent it by investing in their less advantaged communities. I'm hoping that the games will pump more money in their economy so they can finally fix their disgustingly poor distribution of wealth. Hopefully better than Russia's rushed construction and not finished hotels. Only Hospitals? How about police stations and military bases? Or a gun shop if you're desperate.